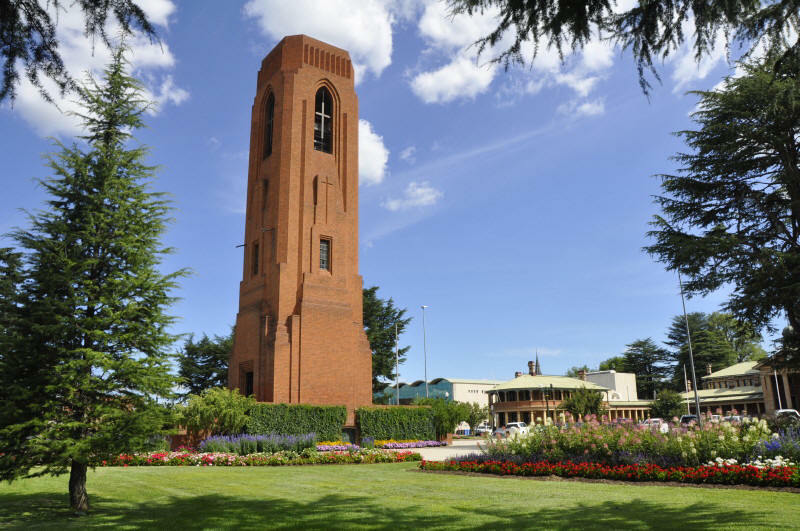 Imagine you have a three octave carillon, in a nice solid 100ft tower in a beautiful spacious park in a wonderful country city. It's been there since the Great Depression, but never had a manual clavier. Easy, you say, buy a three octave clavier and wire her up pronto! But should we assume it will always be a three octave carillon? There's plenty of room for more bells (the frame actually has the holes drilled for two of them!). With such a narrow range, shouldn't we leave some room for growth? The original pneumatic keyboard ran three octaves from C to C, but the bells sound D to D, i.e. it transposes up a full tone. Two bells are "missing", the low Eb and the low F (C# and Eb in keyboard terms). My first impression of hearing the bells (playing under bongatron controller) was that the pitch of all the tunes played seemed high. There could be a number of reasons for that. I'm used to a carillon that transposes downwards by a semitone. Also the external clappers that the bongatron uses bring out the worst in the bells - clashing high harmonics the bell tuner never expected us to hear. Finally, the arrangements used by the bongatron are not necessarily ones you would use if playing manually. Still, it all prompts me to think a future option should be bringing down the system to non-transposing. As they have already used the carillon with orchestra, and I expect they will again, non-transposing would simplify life too. But, apart from the topic of transposition, what other allowances for the future should we make? Seemed to me a four octave range, C to C, would lift the instrument into a different league. It would also bring it closer to the other carillons in Australia, which are both 4 and a half octaves. With those instruments only 3 to 5 hours away by car, I'd expect considerable interchange. Somehow, I didn't spot this until today. It's pretty easy to answer that one! Assuming the space is there to arrange the bells and transmission for excellent control, I would definitely add the bass bells necessary to bring it to concert pitch, and a fully-chromatic 49-bell range. If funds didn't permit all that, the first cut would be the low C#. The great majority of the repertoire is fine without that note, but ideally, it ought to be fully chromatic. Since the Bathurst bells were never laid out with manual playing in mind, I'm assuming, the space for additional bells on the frame is probably a non-issue. You would need new framework and probably a new arrangement of the bells to do it right. Can you post some pictures? I'm rather curious! C'est moi (modestly included just for scaling purposes! ), being surprised by my partner with her camera. The second bell visible from the right is the D I measured for the External vs Internal clapper comparison. - These are the odd-numbered bells, the evens are on the beam to the right of this one. 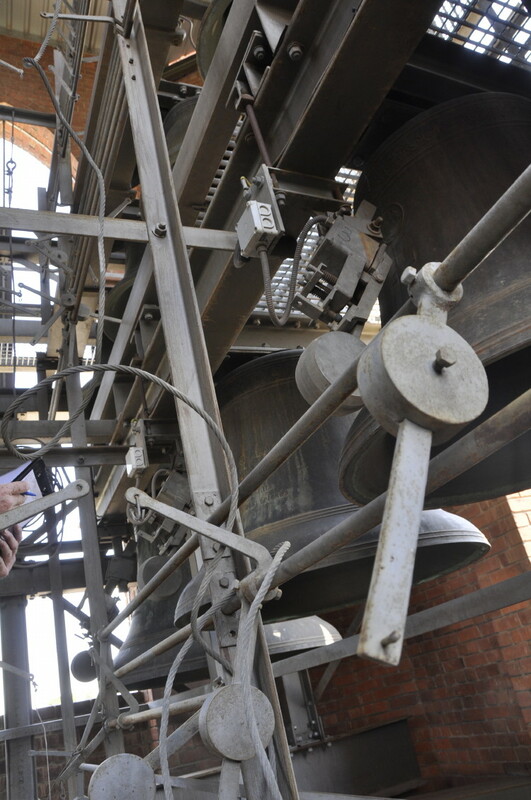 - The scuff marks around some bells illustrating that they have been auto-rotating. A nice feature (not visible here) is that most of the bells carry the name of the local nearby town that raised the money for the particular bell. All done in the post-war Depression years - a remarkable feat. - no clappers (other than externally mounted electrical strikers). Clappers rusting on the floor below. - new metal roof just visible at top left. Originally tower was not to have a roof. - note shape of external strikers - cylinder with chamfered ends. Do they look a bit light to you compared to the size of bells and counterweights? - heavy earth cables on all strikers. Lightning had taken out an earlier bongatron. Probably the wrath of the Lord! Wow! So in fact most of a transmission is still in place, including return springs, roller-bars, and counter-weights! (Actually, it's worthwhile to replace the latter with counter-springs, but all that takes money, of course.) So, an Aeolian pneumatic player worked all this, but there was no console, is that right? While the layout of bells isn't what ideally I would advocate (since I prefer trebles closer to the console), it is a setup that appears to be quite adaptable to fitting up as a proper carillon. Very interesting! You can see the three-octave keyboard at middle bottom, connected to the pneumatic motor unit by a thin soft-metal tube for each note. The upper flap door is resting against the left leg of the pneumatic unit. You can see sliding doors in the middle of it, which would be where a pneumatic roll reader would have been installed (a' la pianola), although I have seen no evidence of this one having had one. The pneumatic motor unit stands like a colossus over the keyboard. The rods you can see are the lower termination of the down-wires, and the knurled cylinders are adjusters, for the same reason we need adjusters. Note plenty of room for expansion to the right! The pneumatic motor unit could handle up to 48 bells. In a more typical set up, a clavier would have stood where the keyboard stands now, and those terminated rods would have extended down to the batons. Further up in the pneumatic motors unit, bellows attached to forked fingers can pull down a lump on the rod and thus pull the downwire. There also appears to be a set of pneumatic relays. The whole system appears to work on vacuum. When a key is pressed, suction is communicated to a relay, switching far more suction to a bellows. The bellows collapses, pulling the downwire. According to history and anecdotes, it was a nightmare to maintain and fell into disrepair quite early on. Years later it was replaced by external strikers and a bongatron controller, which then was struck by lightning, and then by a more modern Apollo II controller. The task now is to upgrade it with a clavier, and at last finish the job so well begun. I'm sure that it will become an absolute jewel (only Australia's third carillon) and will quickly take on a life of its own. Public enthusiasm is high, and they will be delighted by what it has to offer compared to the bongatron. Bathurst lies in a triangle with Canberra and Sydney, a few hours drive each way. It would easily fit into a touring carillonist's travel plans! Fascinating photos! Last I knew, Springfield, Massachusetts (Taylor, 1928) has the cabinet of pneumatics still in place above the console. It doesn't work, I don't think. Trinity Lutheran Church in Detroit has an old Taylor chime that has a working pneumatic system. (It was restored not too long ago, but it worked for a long, long time.) So, the locals have heard something of what the instrument could do with proper action? Because it died so long ago, it would only be the older locals who could remember the better sound of the internal clappers. But I certainly have come across such comments in the historical and anecdotal records. It can be currently played from a MIDI keyboard via the bongatron, but of course there is no expression available and the sound quality is less than inspiring. So there is no-one who has heard it with internal clappers and under full human control. I want to be there on the day, to enjoy the dropped jaws. The ground will be littered with dentures. - there is another identical wing just to right of picture that houses the Mitchell Conservatorium of Music, which will have a practice clavier to train new carillonists. How handy is that? 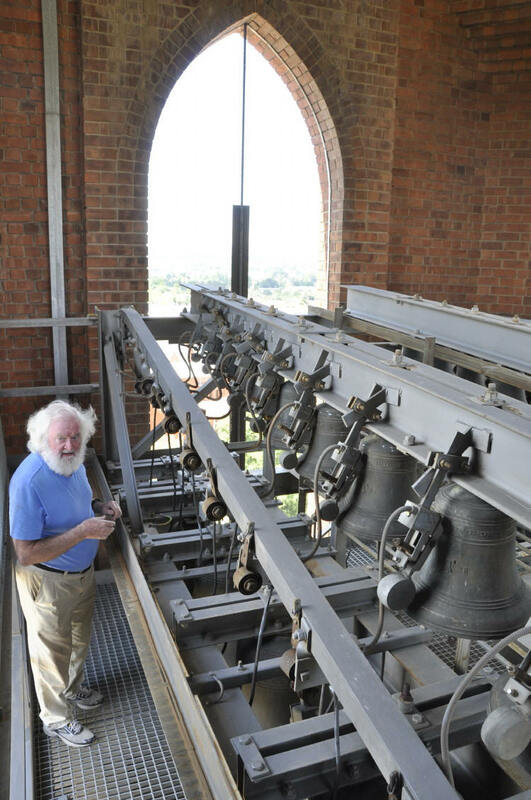 - the Carillon is high in local consciousness. There is a Carillon Fish & Chip shop across the road. (Needless to say, we ate there!) There is a Carillon Tennis Club. The local theatre group is the Carillon Theatrical Society. There is a Carillon clothing shop. As I quipped to my Council contact - this is a gem, a diamond in the rough. We will get this thing operating if we have to melt down some old combine-harvesters for the steel, and cut up the mayor's desk for the wood. Excellent photos and descriptions! The arrangement of the original bellows action is reminiscent of what I found in the tower at Lincoln, Nebraska, in 1965. The bellows themselves were long gone (Ron Barnes had ripped out the whole mechanism many years earlier), but the remains of the cabinetry and the frame for the bellows rack were there above the baton keyboard. If Terry were to open the two large doors above the piano-style keyboard, I'd expect to find the bellows space painted flat black on the inside. Given what's in the tower, it would certainly be possible to drop in an cheap baton keyboard and re-use as much as possible of the existing equipment. But bells, tower and situation of this high quality deserve much better treatment than that. I'd even go farther than John's suggestion. If Bathurst decides to add basses, that will apparently require rehanging all existing bells on a new frame. Then you might as well add the bass B-flat and E-flat, putting the carillon in concert pitch from B-flat and adding trebles as needed to reach 4+ octaves to C. Yes, it would be expensive, but consider the enormous value of what's already in place, donated by citizens of a prior generation.